FIRST EDITION. AN ASSOCIATION COPY OF THE GREATEST INTEREST, inscribed and signed by the subject of the book, President-elect Franklin Pierce, lifelong friend of the author. 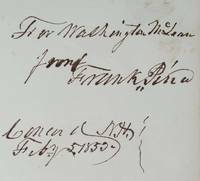 Pierce has inscribed the book to the Ohio newspaper publisher Washington McLean: "For Washington McLean from Frank. Pierce Concord N.H. Feby. 5. 1853." Hawthorne and Pierce met at Bowdoin College and developed a close friendship. In 1846 Pierce played an important role in obtaining for Hawthorne the position of Surveyor of the Custom House is Salem with a salary of $1200 per year. Six years later, Hawthorne wrote this Life of Franklin Pierce, the campaign biography which helped win Pierce the 1852 presidential election. After the election, Pierce made Hawthorne American Consul to the Port of Liverpool. This position allowed Hawthorne a substantial income and provided the inspiration for later works such as The Marble Faun, Our Old Home, and the Italian and English Notebooks. In 1863 Hawthorne dedicated his Our Old Home to Pierce. His publisher and others warned Hawthorne against dedicating the work to Pierce, due to the strong public feelings against Pierce's faction of the Democratic Party, which was viewed as pro-slavery. Insisting upon the dedication, Hawthorne wrote: "I find that it would be a piece of poltroonery in me to withdraw either the dedication or the dedicatory letter. My long and intimate personal relations with Pierce render the dedication altogether proper, especially as regards the book … and if he is so exceedingly unpopular that his name ought to sink the volume, there is so much more the need that an old friend stand by him." The following year Hawthorne took ill, and he prepared for his death taking a final journey to the lakes of New Hampshire with his beloved companion Pierce. On May 18, 1864, Hawthorne died alone with his old friend Franklin Pierce. Association copies of such personal interest linking great American political and literary figures are rarely encountered. Original brown cloth. Front free endpaper excised, else in fine condition. The great Stephen Wakeman, Carroll Wilson, and Parkman Dexter Howe collections all had copies of this title inscribed by Hawthorne, but none included a copy inscribed by Pierce. No other examples appear in the auction records of the past fifty years. Boston: Ticknor, Reed, and Fields, 1852. First Edition. Engraved portrait frontispiece of Pierce. 8vo, publisher’s original dark brown blind-stamped cloth, gilt lettered on spine. Housed in a fine morocco backed folding case. ads, 144 pp. A well preserved and fresh copy with a small abrasion to the head of the spine, housed in a 1/4 red morocco clamshell box. FIRST EDITION IN THE ORIGINAL CLOTH OF THIS HAWTHORNE SCARCITY, and one of only two American presidential political biographies written by men of letters. Hawthorne was a college classmate and friend of Pierce's, and he wrote this during the presidential campaign of 1852. While professing objectivity, Hawthorne considered the work "a political biography, and as a representation of the principles and acts of a public man, intended to operate upon the minds of multitudes, during a presidential canvass. Garrett Press. Used - Good. Former Library book. Shows some signs of wear, and may have some markings on the inside. Boston: Ticknor, Reed, and Fields, 1852. Three Quarters Leather. Very Good binding. First Edition of Nathaniel Hawthorne's Life of Franklin Pierce, penned in aid of his friend's Presidential campaign; it closes the final chapter with a stirring appeal for the reader's vote (pp. 137-138). A noteworthy example of nineteenth century American politicking; a broad voter base and constantly evolving electioneering techniques allowed for novel methods of reaching out to partisans and voters. The publisher notes that 5000 copies were sold to a Mr. Augustus Schell, a highly positioned Democratic Party partisan, who distributed them throughout New York in the month before the presidential election of '52; Pierce would win by over 200 electoral votes. Per the BAL, "This book was issued as an election document and occurs in variant forms. It is entirely possible that all varieties were simultaneously issued [...] Evidence is wanting, however" (BAL 7612). One cover and spine of the green, fine-grained TR-like cloth bound in, with spine imprint 3 mm above the bottom-most blind rule. Lacking original yellow endpapers and flyleaves. Portrait frontispiece, foxed, with tissue guard bound in. Fully rebacked by a conservator using Japanese tissue. Three quarters leather over brown marbled paper. Top edge gilt. Very Good. (BAL 7612). Very Good binding. Seller: Black Swan Books, Inc.
Peter E. Randall. Near Fine in Very Good+ dust jacket. 2000. Reprint. Hardcover. 0914339931 . A crisp clean copy, the result of a school project by the Brett School of Tamworth NH. Signed on the front endpaper by former First Lady Barbara Pierce Bush. (Fourth Cousin, four times removed of Franklin Pierce) This copy shows light shelf wear only. ; Signed by Associated . Gale, Making of Modern Law. PAPERBACK. 1240007590 New Condition. . New. Gale, Making of Modern Law. PAPERBACK. 1240007590 Like New Condition. . Fine. 2015-03-11. Good. Ships with Tracking Number! INTERNATIONAL WORLDWIDE Shipping available. May not contain Access Codes or Supplements. May be ex-library. Shipping & Handling by region. Buy with confidence, excellent customer service! 2010-12-17. New. Ships with Tracking Number! INTERNATIONAL WORLDWIDE Shipping available. Buy with confidence, excellent customer service! 2009-03-06. New. Ships with Tracking Number! INTERNATIONAL WORLDWIDE Shipping available. Buy with confidence, excellent customer service! 2009-03-06. Good. Ships with Tracking Number! INTERNATIONAL WORLDWIDE Shipping available. May not contain Access Codes or Supplements. May be ex-library. Shipping & Handling by region. Buy with confidence, excellent customer service! 2014-04-02. Good. Ships with Tracking Number! INTERNATIONAL WORLDWIDE Shipping available. May not contain Access Codes or Supplements. May be ex-library. Shipping & Handling by region. Buy with confidence, excellent customer service! 2016-11-30. Good. Ships with Tracking Number! INTERNATIONAL WORLDWIDE Shipping available. May not contain Access Codes or Supplements. May be ex-library. Shipping & Handling by region. Buy with confidence, excellent customer service! 2015-12-11. Good. Ships with Tracking Number! INTERNATIONAL WORLDWIDE Shipping available. May not contain Access Codes or Supplements. May be ex-library. Shipping & Handling by region. Buy with confidence, excellent customer service! 2018-06-25. Good. Ships with Tracking Number! INTERNATIONAL WORLDWIDE Shipping available. May not contain Access Codes or Supplements. May be ex-library. Shipping & Handling by region. Buy with confidence, excellent customer service! 2018-08-12. Good. Ships with Tracking Number! INTERNATIONAL WORLDWIDE Shipping available. May not contain Access Codes or Supplements. May be ex-library. Shipping & Handling by region. Buy with confidence, excellent customer service! 2002-12-12. Good. Ships with Tracking Number! INTERNATIONAL WORLDWIDE Shipping available. May not contain Access Codes or Supplements. May be ex-library. Shipping & Handling by region. Buy with confidence, excellent customer service! Kenneth a Brett School. Hardcover. 0914339931 New Condition. . New. Kenneth a Brett School, 2001-04. Hardcover. Good. Gale, Making of Modern Law, 2010-12-17. Paperback. Good. Peter E. Randall. Very Good+ in Very Good+ dust jacket. 2000. First Edition Thus. Hardcover. 0914339931 . A crisp clean near new copy that appears unread. This edition was published for the Tamworth School District. ; 9 X 6.10 X 0.70 inches . Gale, Sabin Americana, 2012-02-22. Paperback. Good. The Life of Franklin Pierce. Peter E. Randall, 2000. First printing thus. Fine in fine dust jacket, in mylar cover. B&W illustrations and photos. Fredonia Books (NL), 2002-12-12. Paperback. Used:Good. Fredonia Books (NL). PAPERBACK. 1410202933 Special order direct from the distributor . New. Fredonia Books (NL), 2002-12-12. Paperback. Good. Dodo Press, 2009-03-06. Paperback. Used:Good. Dodo Press, 2009-03-06. Paperback. Good. Dodo Press. PAPERBACK. 1409962636 Special order direct from the distributor . New. Dodo Press, 2009. Paperback. Good. Disclaimer:A copy that has been read, but remains in clean condition. All pages are intact, and the cover is intact. The spine may show signs of wear. Pages can include limited notes and highlighting, and the copy can include previous owner inscriptions. At ThriftBooks, our motto is: Read More, Spend Less.Dust jacket quality is not guaranteed.